The recent events happening in the US have been tragic. Our country’s history of oppression has left deep wounds that have yet to be healed. Though we have made great progress, racism is still a serious problem. What can we do? We can march in protest and raise our voices to be heard, but is there something else that can be done to help heal all this pain and suffering? Beyond the physical, financial, and emotional support we can give each other, we can also give spiritual support to this cause. And though subtle to the world at large, this spiritual support is what can truly shift the consciousness of this country and world on the whole. How do we do this? We must practice COMPASSION. Compassion is the understanding of suffering. And until those who suffer are understood, joy and peace can not fill their hearts. All these things; compassion, understanding, joy, and peace, are all subsets of LOVE, THE HIGHEST VIBRATION IN THE UNIVERSE. Racism contributes to the feelings of being unwanted and unworthy. It’s a form of shame imposed on a group of people. The collection of these thoughts causes deep hurt. Being racist comes from a place of not feeling worthy enough that one must push down others to gain a feeling of being higher than them. Being a “better” race is the thin stick used to support their fragile ego. They will do whatever it takes to protect their sense of themselves, banding with like-minded people and going as far to arming themselves against anyone they perceive to be encroaching on their energetic territory. They do this all to prevent their fragile ego, for it is only this ego tied to the superiority of their race that prevents them from feeling unworthiness. Racism is an outer shell, an elementary level of ego-glue used by those younger and less spiritually experienced. We were once spiritually inexperienced like them, maybe not in this lifetime, but in others. If we intuitively feel into ourselves we will find these memories from other lives where we were just as spiritually experienced as the people we see now in the news. There is a Buddhist doctrine called “The Principle of Mutual Arising.” It states that enemies arise together, that one enemy can not exist without the other; that they mutually create each other into existence. By fighting on either side more of the other enemy is created. We remove zithromax online ordering ourselves from this dynamic by stepping into the neutral space of love. Love in its true form is a neutral power, seeking no sides, only balance and centeredness. Compassion is the path to this neutral space. Compassion is that which dissolves the need to take sides. Because from the point of compassion one sees that everyone is suffering and everyone is in need of understanding. And once we understand and can hear each other’s pain, then and only then, will we feel safe to put down their mask of ego and safely reveal our hearts. One way we can bring more compassion into the world is through this exercise: When you walk down the street, for every person that you see, and especially for anyone you meet eyes with, think the word “peace.” Send this energy through your eyes to the other person. Remember, you eyes are the gateway to your soul and very potent energy is transmitted this way. Not only does it put you in the space in neutrality, you are delivering a gift to the another’s soul. There is nothing for the other person to defend when the energy is neutral, thus they receive your gift energetically. They may not react to it now, but given time as they receive more and more of this compassion and love from themselves and others, do they create the space to heal and grow. And because this energy is neutral there is nothing for you to receive back. The gift of love is also the reward. 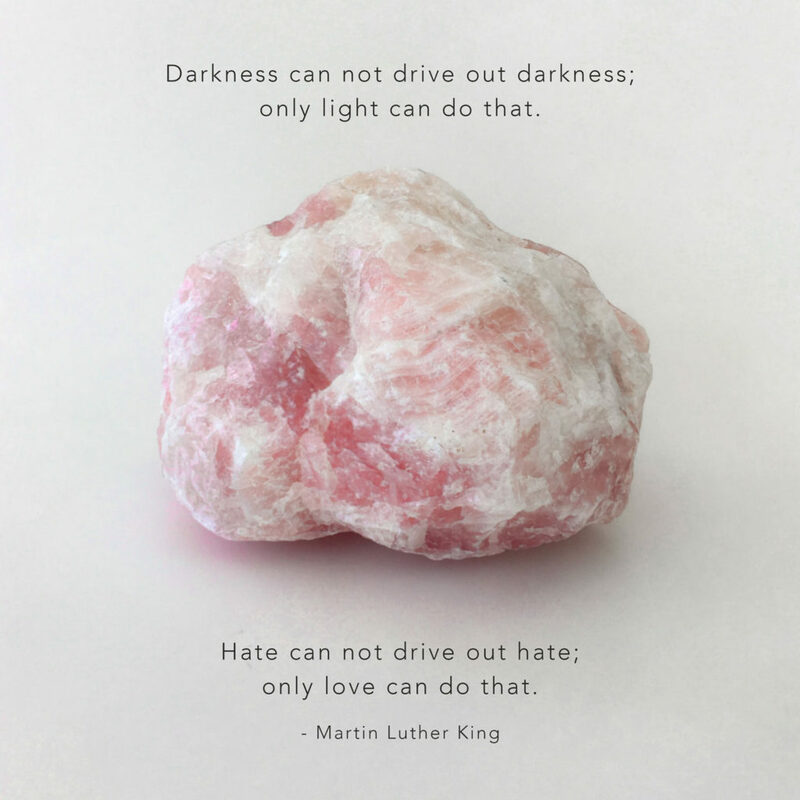 The photo above shows ROSE QUARTZ because it is the stone of universal love. Compassion, understanding, joy, and peace are all subsets of love. Is is only through love that we can bring in light. And it is only love that can overcome fear and hate.